While other husbands show off their love for their spouses on social media through selfies on birthdays, Valentine's Day and the like, for Nhlanhla Nxumalo that was not enough. 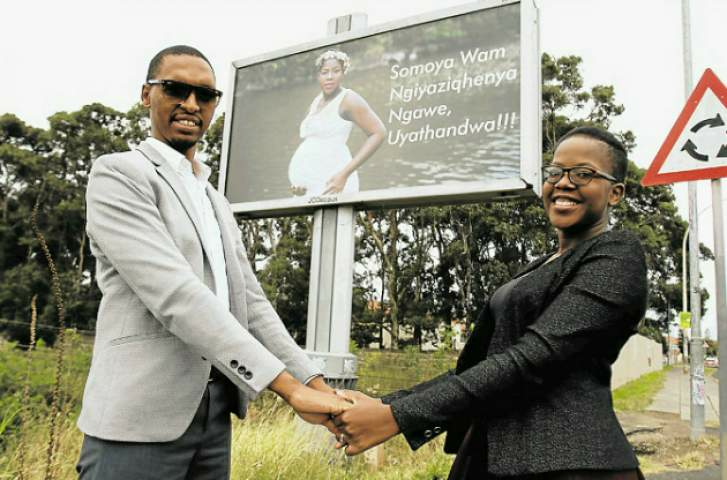 The man based in the Eastern Cape, who grew up in Bulawayo's Old Pumula suburb popularly known as emadonkini area went a step further by putting up a billboard along a busy highway in South Africa with his pregnant wife Sindiso as the star attraction. The billboard with his wife's picture and some special words "Somoya wam, Ngiyaziqhenya Ngawe, Uyathandwa (My soul mate, I am proud of you, you are loved), had social media buzzing for the better part of the month in Mzansi. The billboard has definitely become the talk of that country as people have showered Nhlanhla with praises for showing off the love he has for his wife. In an interview, Nhlanhla said he just wanted to appreciate his wife. "I wanted to make my wife feel special with the gesture. She had been on maternity leave for about four months and it was hard for her to leave the baby behind as she returned to work. I wanted to cheer her up through this gesture. These days we live in a world where grandmothers aren't near to us to help her with the baby," said Nhlanhla. According to studies, 67 percent of mothers suffer from separation anxiety when they first return to work after having a baby and two-thirds of the working mums feel guilty about being away from their children when at work. So as a remedy Nhlanhla decided to put up the billboard. "She was stressed because she was even contemplating not going back to work so that she takes care of the child. This was my small way to settle her mind and give her something to smile about and forget the stresses of being a mother," said Nhlanhla. The ex-Milton High School pupil who works as a technician in Mzansi said he was prepared to do anything to put a smile on his wife's face. "I'm happy at how excited she was when she saw the billboard with her picture on it. Even the added attention from people who started talking about the billboard made her day. People's attention has shifted from them asking how the child is to people talking about the billboard every time they meet me, her or us, which eases her mind." Refusing to reveal how much he paid for his romantic stunt, Nhlanhla said the billboard was erected on May 1 when Sindiso was on her way to the salon. "The original idea was that when she returns to work on May 2, she'd see it on the main road. However, the billboard was erected a day before so she ended up seeing it when she was on her way to the salon to do her hair in preparation of getting back to work." Sindiso a lawyer at the East London Magistrate's Court said it was unbelievable seeing herself on a billboard. "I was on my way to the salon and I saw the picture from afar then I said to myself, this looks like me. When I got closer, I was shocked upon realising it was me. I was confused as to how this happened," said Sindiso. After all that has been said and done, Nhlanhla believes that he has done the right thing with his friends feeling challenged to do something similar for their wives. "Other people have been envious of what I've done for my wife. My friends especially, say they feel challenged and would want to do the same. I read on social media that some women feel that my wife is the luckiest woman alive to have a husband like me."